All is right with the world!!!! 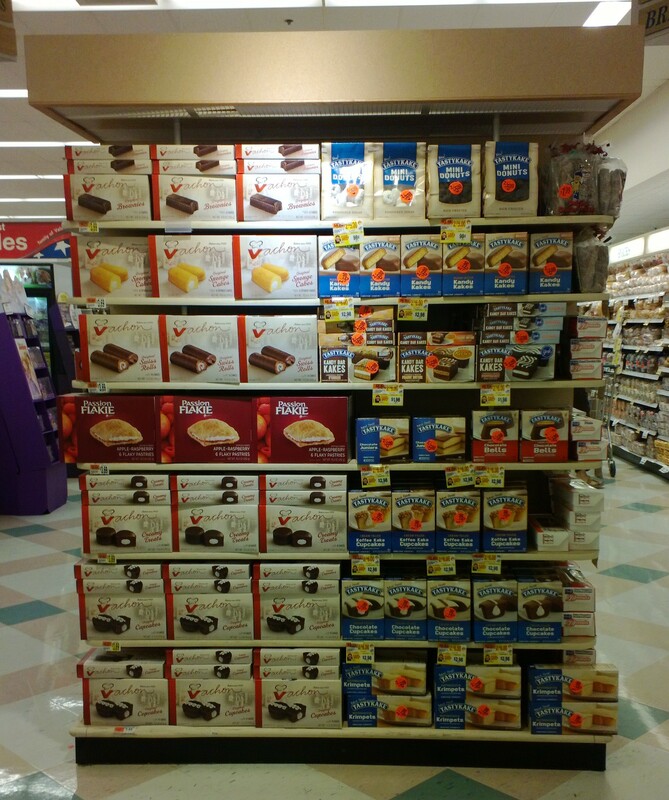 I cannot tell you how joyful – nay, elated – I was to see this display, alive once again, at my grocery store this weekend. Well, maybe I can. We got some terrible news at the end of 2012. 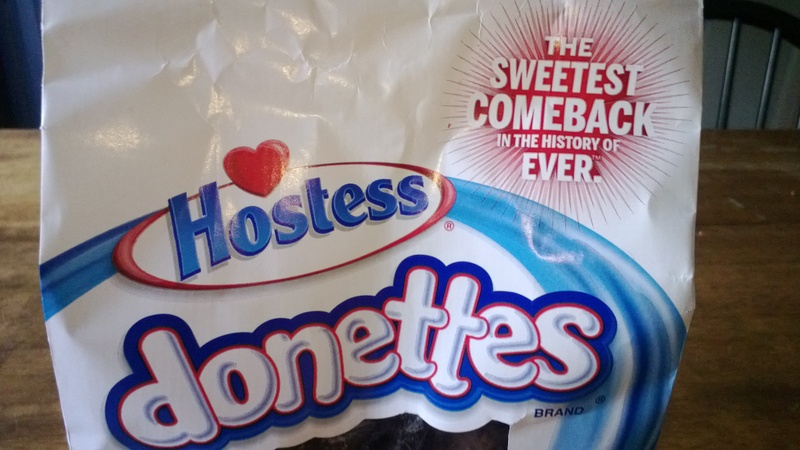 Hostess was closing, mostly the fault of poor management, but they were blaming it on the workers (shocking). I thought, well, I suppose I can live without Hostess, as long as I have Drake’s Cakes. Then I found out they were the same company. Curses!! No seriously, it’s all funny now, but I was really depressed. I was raised on these treats. I mean, they were the ONLY treats in the house. My mother made (and still makes) insanely delicious chocolate chip cookies, but as far as junk food goes, Hostess and Drake’s were it. There was a cake at the end of every school day, waiting on a plate on the table, the comfort of home and mom. My favorites were Suzy Q’s. The obsession lasted through my teens, when the choice of school lunch was sometimes Cup Cakes from the vending machine. And then into the college years, when a road trip treat was anything off the Hostess rack at the gas station. Those cakes were always there, and then they were gone. Ironically, only weeks before the collapse, I’d seen a driver bringing Hostess into my local gas station and thought, you know, that would be a fun job. Driving around those cakes all day, being out and about, meeting people, listening to audiobooks on the road. Little did I know. That poor guy was unemployed the very next month. 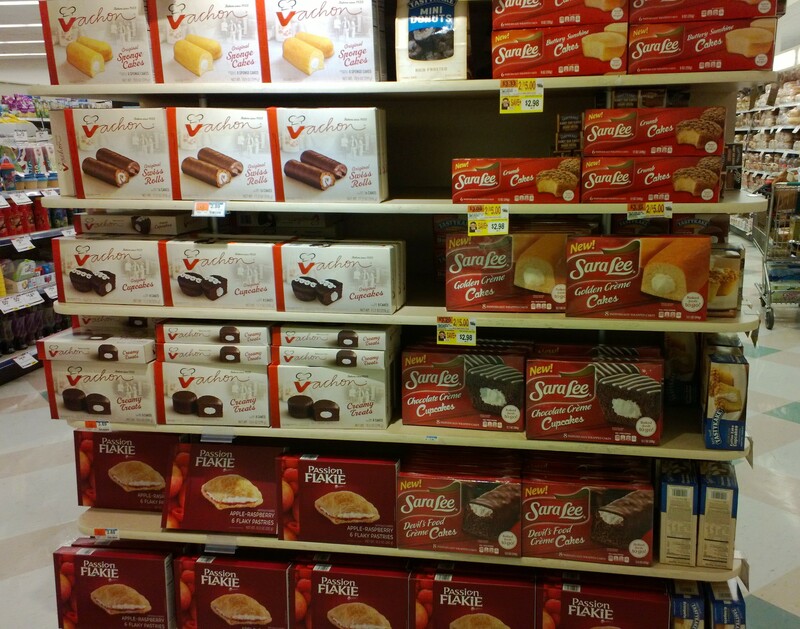 In January I sought out the last few boxes of Coffee Cakes and Yodels. They were all that was left at the third grocery store I tried. The boys and I sat down for a snack when I got home, and though I tried valiantly to hide the stash, they found them. The boxes were soon empty. I actually thought about buying some crazy overpriced boxes on the internet but that was going a bit too far even for me. 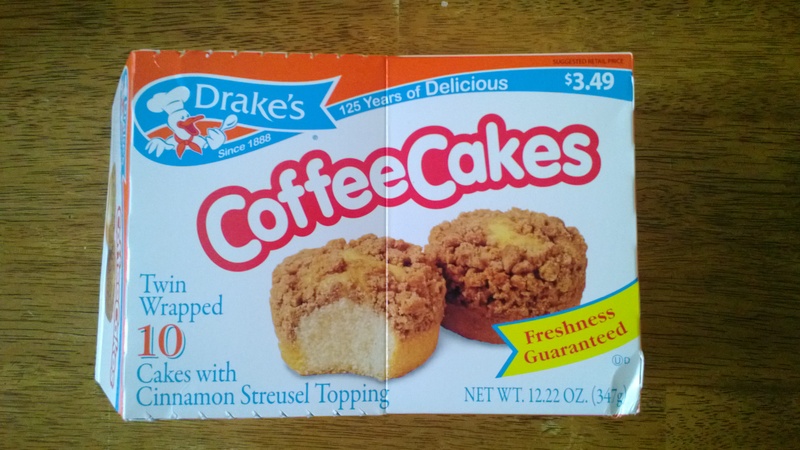 Then, strangely, I found a stash of Coffee Cakes at one of the last real smoke shops in Western Mass. Nobody buying tobacco and scratch tickets cares about sugary kid snacks. 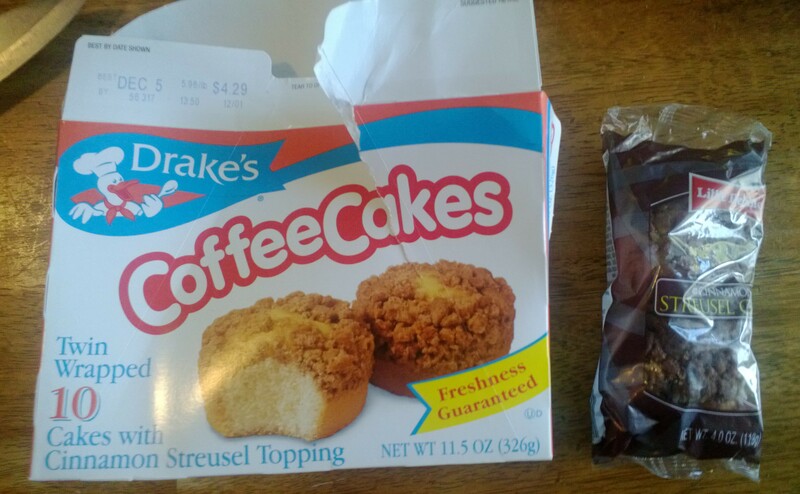 I bought one last oversized single pack Coffee Cake. I saved it and saved it. Then, when we were socked in during a February blizzard, I unwrapped it, put it on a plate, sat at the kitchen table, and ate it. …and I was comforted to know that I at least had some vague replacement, if not the real thing. And all love to Little Debbie, another lifelong passion (actually come to think of it, there were quite a few Peanut Butter Crunch and Nutty Bars there during childhood), but they just weren’t the same. There’s Vachon on the left. Vachon? Who ever heard of Vachon? My guess is they invaded from Canada. 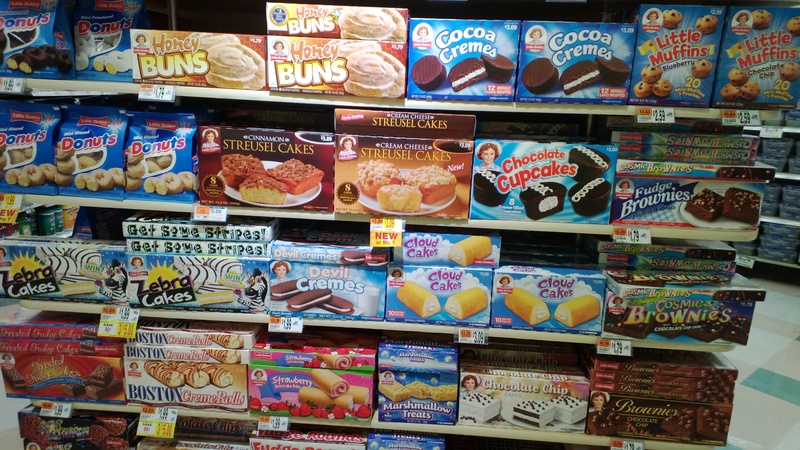 TastyKake is there on the right. They were second rate back in the day (sorry anyone who loved them dearly). But you may notice they were already on sale at that point. Apparently they were being cleared out for Sara Lee, which appeared by mid-June. Sara Lee was always pretty good, but even at this point I still hadn’t bought any replacement cakes. 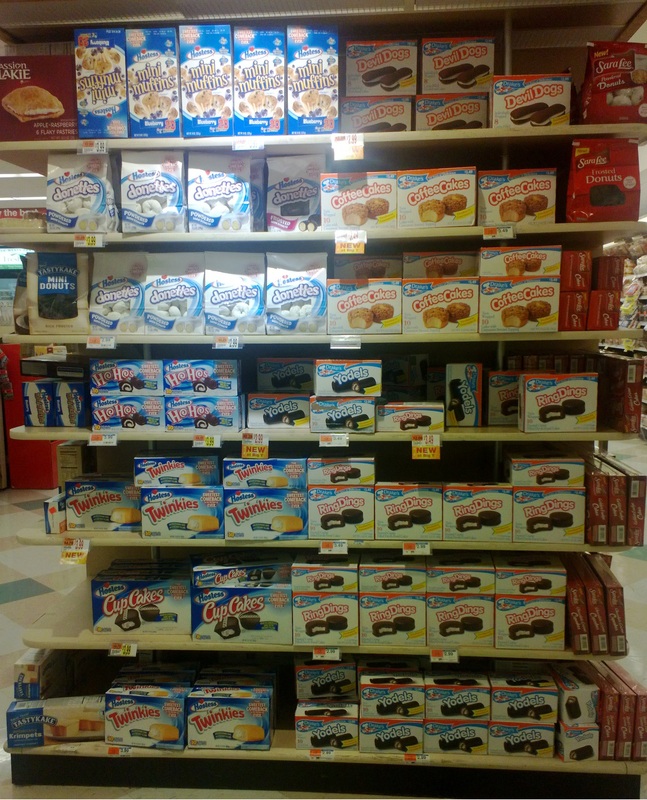 Maybe now you can see now how much I truly loved Hostess, because I kept stopping at this damn shelf in the store trying to figure out how to fill the hole in my soul and stomach. I took all these pictures because I was planning on writing about it, including a taste test just to prove how second-rate any replacement would be. But I could never stand to open up the last hidden cake. By the time I finally decided to bite the bullet (and the cake) and sit down to write the post, the Drake’s had gone stale. Apparently they do have a shelf life after all. Still, before I threw the precious cakes out, I breathed in the aroma of that particular cinnamon smell. Only for five minutes or so. Then in July, while we were on vacation, we saw an ad: some of the treats were coming back!! You said it, sister. Older Son was thrilled because the Donettes were his favorite. Lucky him. No Suzy-Q’s for me, or Snowballs for Younger, but if we had to suffer with only tasty little bite size, somewhat crispy around the edges, with soft yellow cake in the middle chocolate-covered donuts, I suppose life could go on. And then, last weekend, there, on the sad little shelf that I’d visited for so many long months, was an entire stock of Hostess AND Drake’s. I couldn’t believe it. I had no idea they were bringing back so many more cakes!! I was stunned, and thrilled, and didn’t even think twice as my hand pulled two boxes off the shelf. By the way, the Vachons were relegated to the clearance table, $1.99 each, right where they belonged. We each devoured a delicious, precious, wonderful, life-giving Crumb Coffee Cake. I think I had tears in my eyes. Sure, we’ve found some Snowball replacements over the course of this misadventure, but they’re not the real thing. So from here on in, I vow to do my duty to keep Drake’s alive. I’ll never take them for granted again. I’m sure my sons won’t mind joining me in this effort. Come on, people, help us out. Go ahead, buy some junk food. Eat it when you’re depressed. Quit worrying that it’s not healthy. Buy often. Don’t feel guilty. Me and my boy are still waiting on the Snowballs and Suzy Q’s. This entry was posted in Life Beyond Work and tagged Drake's Cakes, Hostess by Amy Pybus. Bookmark the permalink. I really enjoyed this article but I have to say your slur on Tastykakes didn’t sit well. I grew up on these in Philadelphia and lamented the fact that one couldn’t get them here in the Valley. And then one day they were on my supermarket shelf. I don’t know why but they appeared. Not with the same wonderful variety as back then but enough choices to make me smile. So please, take back your Tastykakes put down! I knew there would be someone out there who loved Tastykakes!!! Sorry Meryl 🙂 Now I’ll just have to try them again and see what I missed.